Every single image you display through your business is a reflection of your brand as a whole. Putting some thought into how these images are grouped and displayed can go a long way to making your business appear professional as well as legitimate. This is especially true of your social media accounts. Everyone has a visual side, and even if “design” is not your forte we all subconsciously appreciate well-curated image collections. Often it’s not hard to recognise streamlined brands, but to figure out why these brands look so great and then how to curate and streamline our own businesses can be tricky. 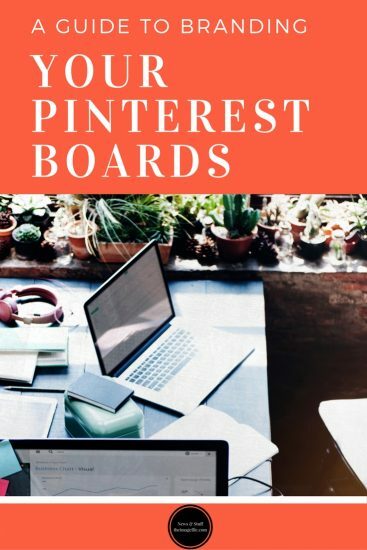 Pinterest is one of the most visual social media platforms around, and although it’s vital that you provide content that clients would want to pin, it is also important to have professional, consistent looking boards. So here are a few helpful ways you can start branding your Pinterest account. There has always been a debate about whether to combine personal and business social media accounts. Some people believe that personal and business content should always be kept separate, especially when it comes to social media. This is for various reasons, but the main one being that it looks more professional. On the other hand, some people feel it’s better to combine personal and business content on social media because it makes you look more human and approachable to your clients. To be honest, at the end of the day you need to do what you feel comfortable with and believe is best for your business. It may be just a profile picture, a name, a short descriptive sentence and a link but it should be thought about. When it comes to your profile picture, the most important thing is to keep it consistent with your other social media accounts. This makes it easier for clients to recognise you and maintains professionalism and consistency. Today, Pinterest is used in a similar way to Google so take this into account when choosing your name. If you have combined personal and business then you might want to use both your own name and your business name such as Sarah Jones | Your Photography Business. This way if someone searches for either name then they will be able to find you. For your description, you should highlight the main aspects of what you do. For example; contemporary newborn and family portrait photographer based in Guildford, Surrey. Equally, for your link, make sure it is verified (which is what that red tick icon means). By verifying your website you are reassuring other pinners that your website is legitimate, professional and safe. You have the chance to enhance your brand through the content you include within your boards. You should be showcasing your areas of expertise through your boards by creating relevant categories. Let’s say you specialise in weddings, engagements and anniversaries then you should create boards that highlight these e.g. proposals, engagement rings, bridal beauty, first look and even colour schemes and wedding dresses. Not only does this give you the chance to pin your own work, but also show the types of weddings you prefer to photograph such as classic and timeless or modern and alternative. This might sound a little cynical but it’s important to refrain from pinning out of focus or tiny images. Yes, these images and articles may be useful to clients, but the visual appearance of your account is really important. Consider your own image style and try to keep your Pinterest boards consistent. This way you can continue to pin boards like Interiors and Food while still maintaining brand consistency. Pinterest allows you to choose which images appear on your board preview. Take some time to consider these images, as well as organising your boards, so that they are visually appealing to a visitor. This might be by varying the colours, choosing images that crop well and look good next to each other and placing the most relevant boards towards the top of the page, like your own work or something seasonal. One of the main advantages of using Pinterest for your business (and blog) is the ability to drive extra traffic to your website. Every time you release a new collection, add images to your portfolio or post to your blog make sure you pin those images to your account. Filling your boards with pins from your website is one of the best ways to get your brand out there in front of potential clients. Remember that the content you share on social media should be a reflection of your brand and business. By branding your Pinterest boards you are maintaining consistency across social media, you are appearing more professional and legitimate to your audience and increasing recognition across all social platforms. Need help branding your account? Check out our Social Media Service.